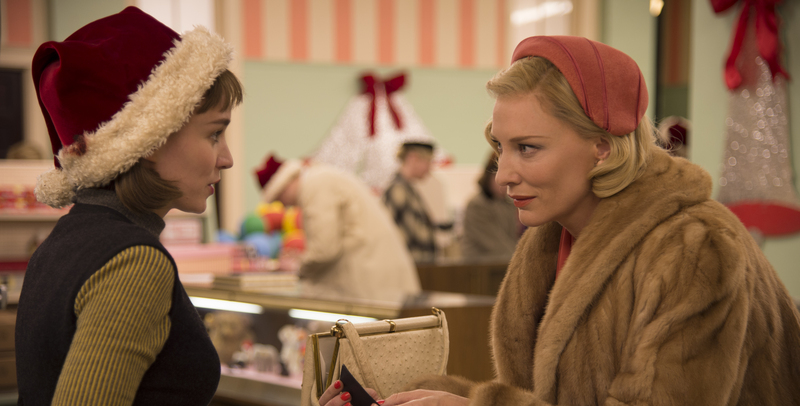 What first attracted me to Carol was its intoxicating 1950s charm, so perfectly rendered on Super 16 through curled bobs topped with little hats, analogue phones and cameras, and humble department stores decorated for Christmas. The trappings of these quaint details present an illusory comfort which director Todd Haynes need not discard as the unease of this forbidden love story begins to surface. Indeed, it is the maintenance of this paper-thin, idyllic veneer which so perfectly simulates the imagined postwar conformity acting to stifle the love between a virginal shopgirl and a predatoress dressed in furs. Adapted from Patricia Highsmith’s The Price of Salt – an underground novel initially published in 1952 under a pseudonym – the defining genius of Carol is its excellently executed art of suppression. Unlike Brokeback Mountain, or other heart-wrenching LGBT blockbusters to come before it, this is a film unlikely to rob you of any tears. Instead, it carries emotion through concealed glances, or the stolen touch of a hand. Blanchett proves she can do restrained just as well as the overblown melodrama that won her the Oscar for Blue Jasmine, while Mara makes use of her otherworldly beauty as the introspective, “flung out of space” Therese, who finds herself seduced by the glamorous older woman owing to her inability to make her up own mind or ever say ‘no’. Heck, she can’t even decide what to have for lunch. Crucially, Therese finds her way into Carol’s life as the latter hurtles towards a messy divorce, which will cut her off from both a husband and a daughter. As we are subtly guided by such motifs as the brushing of hair or a childhood photograph, we realise that the displaced Carol is seeking not only a romantic and sexual partner, but also a replacement child, from the guileless young Therese. We are incidentally made aware that these two women are a generation apart. The younger of the couple will pursue a successful career at The New York Times, while the elder is left with nothing, having failed at the only role she can conceive for herself as a woman; that of the wife and mother. Accompanied by a stunning score from Carter Burwell, and stolid performances from supporting cast members Kyle Chandler and Sarah Paulson, the fragile and tragic beauty of Carol will burrow its way into your head, and stay there for a long time. Carol is playing as part of the BFI London Film Festival, and will be on general release from November 27th. Check out the trailer below. « Green Arrow Is Back. Season Four Starts Tonight.